Has the Arab Spring killed the North African mobile market? Somebody asked me the other day whether the Arab Spring had affected the growth in the mobile subscriber market, and which was now the fastest growing region. The countries affected were and are major players. Markets where a regime change was engineered are Egypt (34% of the regional total); Tunisia (5%); and Libya (6%). There were major protests in Algeria (18%); Morocco (15%), and Sudan (9%) (1). The creation of a new nation in the form of South Sudan has created further problems for the Sudanese government. Looking at the five major African regions by mobile subscribers for the period Q1 2011 to Q1 2013, it is apparent that Northern Africa appears to have lost its shine, with a negative figure being recorded in Q1 2013, directly attributable to Tunisia and Egypt. According to data from Egypt's MCIT, Egypt lost some 2.7 million subscribers in the period January - March 2013, or a fall of 3% on the previous quarter. Southern Africa owes its original sparkling performance to South Africa, which is home to two major regional players, Vodacom and MTN. With mobile penetration now nudging 136% in South Africa, the early growth phase is now over, and the emphasis is now on data, with the four networks busy trialling or rolling out 4G. And, as the chart suggests, there is still a great deal of potential in Western, Central and Eastern Africa. Nigeria accounts for about half of the mobile subscribers currently in Western Africa, although the recent registration program may see this number fall whilst the market regroups. However penetration in Nigeria stands at 73% prior to the registration deadline, and so it can be expected it will resume its upward trajectory in the latter part of 2013. In parallel with SIM-registration, the Nigerian authorities have also introduced Mobile Number Portability, and it was rather telling last week that an official was attempting to tell users they would be better porting their numbers rather than buying phones capable of holding multiple SIM cards. This neatly illustrates another dynamic of the African market, namely that there is a significant difference between subscribers and subscriptions, with many subscribers having more than one subscription. Nonetheless, there is still remains considerable potential along the North African coast. Egypt had a mobile penetration of 111% before the current troubles erupted; Libya has a relatively high penetration at around 120%, but there are structural issues with its network following the civil war. 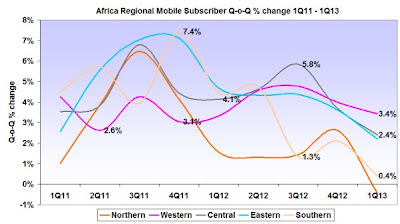 However Sudan is recording high subscriber uptake, and has a relative low penetration of 68%. The snag in Sudan is the collapse of the currency, its oil being in the newly formed South Sudan. So Northern Africa is down, but certainly not out.